Buffalo Bulls guard Hanna Hall drives with the ball against Northern Illinois guard Paulina Castro during NCAA women's basketball action in Buffalo, N.Y., on Feb. 26, 2019. Hall had 12 points and eight assists for the Bulls on Friday's game. The team with the most Canadian representation at March Madness is moving on after an upset victory on Friday. The No. 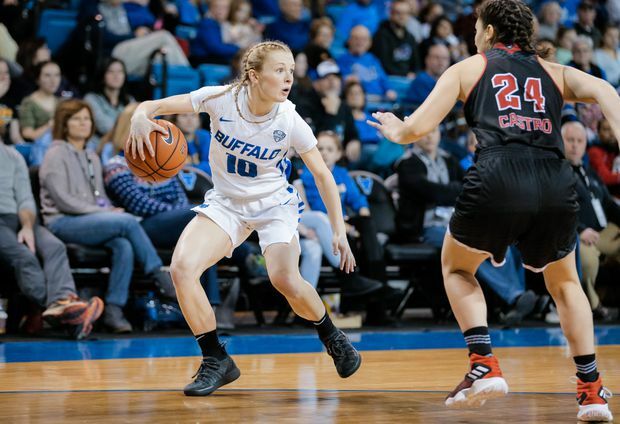 10-seeded Buffalo Bulls women’s team, featuring five Canadians, pulled away late for a 82-71 win over the No. 7 Rutgers Scarlet Knights in Storrs, Conn. Starting guard Hanna Hall of Hamilton had 12 points and eight assists for the Bulls, while starting forward Adedola Adeyeye of Brampton, Ont., chipped in with four points and five rebounds. The Bulls’ other three Canadians – Oceane Kounkou of Gatineau, Que., Ayoleka Sodade of Windsor, Ont., and Keowa Walters of Toronto – did not play. Buffalo is trying to advance to the Sweet 16 for the second year in a row. It was a slow start for Canadians on the second full day of March Madness, but a couple of Canuck starters enjoyed victories in their tournament kickoffs on Friday afternoon. Tennessee senior forward Kyle Alexander of Milton, Ont., had two points and five rebounds as the second-seeded Volunteers withstood a Colgate rally to beat the No. 15 Raiders 77-70 in Columbus, Ohio. While he didn’t have a huge day, at least Alexander erased memories of being sidelined with a hip injury in Tennessee’s second-round loss to upstart Loyola-Chicago last year. The Ramblers went all the way to the Final Four after that win. Meanwhile, Hamilton’s Hailey Brown had six points and two rebounds as the No. 8-seeded Michigan Wolverines women’s team beat the No. 9 Kansas State Wildcats 84-54 in Louisville, Ky.
Another Canadian starter experienced a different result, though. Montreal’s Luguentz Dort was held to 12 points by Buffalo in the Bulls’ 91-74 win over the Arizona State Sun Devils in Tulsa, Okla.
Dort, who had 21 points in Arizona State’s play-in win over St. John’s on Wednesday, shot 4 of 12 from the field against Buffalo and had three rebounds, two assists and four fouls.